Experience the mother city in a whole new way, Paragliding in Cape Town is definitely a bucket list item! 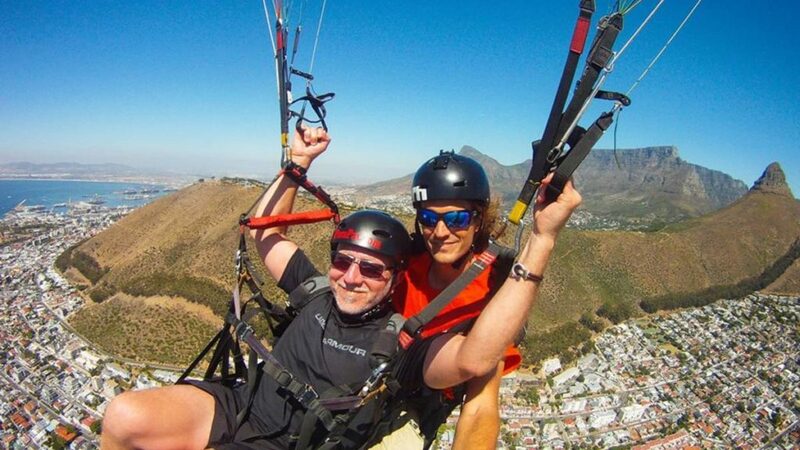 Enjoy an incredible tandem paragliding flight from Lions head or Signal Hill. It is definitely one of the most exciting adventures you will do in Cape Town. Not many other activities would let you enjoy such spectacular panoramas of Table Mountain and the Cape Town City Bowl with no windows to block your view! No matter how nervous you might feel before the takeoff, the experienced team will put you at ease and make sure you are comfortable and safe. Once you are in the air you will enjoy a birds eye view of one of the most beautiful cities in the world! 2. when wind encounters a ridge in the landscape, the air is forced upwards, providing ridge lift. In mountainous environments, flying is mostly based around thermals, which can be used to stay aloft before heading for a landing field below the launch site. In hill environments, ridge lift is used for ridge soaring, and landing can be done either back at the launch site, or at a landing field at the bottom of the ridge. In either case, more experienced pilots can use thermals to go ‘cross country’. Tandem paragliding flights involve a passenger being securely strapped into a comfortable flying harness positioned in front of the pilot and connected to the pilot and the glider. The tandem glider is specially designed to carry two people and is nearly twice the size of a regular solo paraglider.